Grilled until soft and moist, this cheese and eggplant combination is a tasty alternative as a lighter meal idea. It can also be served nicely as a side dish. Brush or spray grill grates with cooking oil or vegetable cooking spray. Preheat grill until hot and place heat on medium setting. Wash outside of eggplant and let dry. Insert prongs of a fork into the outside skin of the eggplant to allow air to escape during grilling. Brush outside of whole eggplant with olive oil or cooking oil. Place whole eggplants on grill to cook, turning on alternate sides occasionally as it cooks. Grill for approximately 30 minutes or until inner flesh is very soft and tender and outside skin is soft, wrinkled and slightly charred. 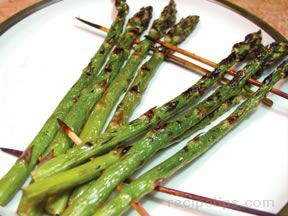 Remove from grill and slice in half lengthwise. 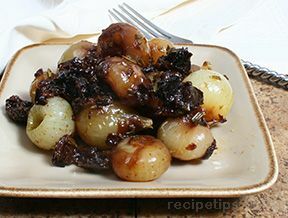 Being careful not to damage the outer skin, remove the flesh with a spoon and place on a flat work surface or large flat plate where it can be softened and mashed with a fork. Retain skins for stuffing. Break cheese into crumbles and mix with the mashed flesh of the eggplant. Select herbs of choice, such as parsley, cilantro, or basil to be added to the mixture. 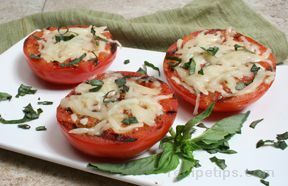 Chop herbs into small pieces and combine with flesh and cheese mixture. Add salt and pepper to taste. After all ingredients are mixed together, scoop the contents into each half shell of eggplant. 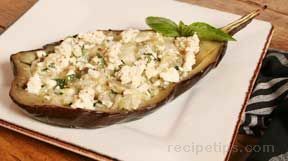 Heat stuffed eggplant on grill or in oven for 3 to 6 minutes or in microwave for 1 minute to warm the contents and melt cheese. Garnish with several crumbled pieces of feta and several fresh herbs. Serve immediately.